In “His Girl Friday” Cary Grant rails at an “insignificant, pimple-headed, square-toed spy.” I forget with whom or why he is upset, he spends half the movie ranting beautifully. But that’s neither here nor there. The quote chosen is merely a good segue into discussing a pet peeve of mine. Namely, the sartorially neglected foot. Want to up your style quotient a notch? Then please, I beg of you, get rid of any of those clunky square-toed shoes left in your closet. I don’t mean the elegantly tapering, chisled toe Italian jobs that make your feet look very long and thin. I mean the chunky black loafer that is best suited to accompany your Frankenstein costume come Halloween. There, don’t you feel better? Lighter? More elegant already? I hope so. Divesting yourself of any part of your wardrobe is always a difficult first step to take. But it’s sometimes necessary. We, and I include myself here, are trying to build functional and elegant everyday wardrobes that will stand the test of time. Wardrobes that are firmly grounded in tradition, which emphasize our best features and minimize our flaws. So on to step two. Invest in the highest quality shoes that you can afford. At least two pair, one dark brown, the other black. 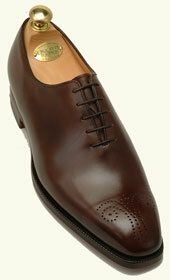 If you wear suits, opt for less ornamentation, choosing a captoe or even plain toe to begin. That way you don’t have to worry about the formality of your suit and shoe matching. If you’re a sportcoat kind of guy, you have more options. I usually wear slip-ons or a monk strap with a sportcoat, wing-tips work ,too. Step three? Take care of them. Clean and polish your shoes regularly. They actually get better (and better looking) with age. Don’t wear the same pair two days in a row. Put the pair that you’ve just worn on a pair of cedar shoe trees to let them air out. The shoe trees will absorb perspiration while helping to retain the shape of your shoes. Resole whenever you need to. And a last plea: please don’t wear your boat shoes (Topsiders) with anything other than jeans or shorts. Even if high school was only a short time ago. In terms of “design,” (construction may be the better word) the last shall be first. An elegant last will make your foot look great. Check out Edward Green’s examples. More information than you probably need to start is readily available on-line. Style Forum’s thread is particualrly exhaustive and informative. This entry was posted in Elegantology and tagged Cary Grant, Elegantology, films, shoes. Bookmark the permalink.